The GS60c (model B5002) is the economy model of the 60” Goalrilla backboards. It has a 60”X36” backboard, a 5.5” steel pole, a 2 ½ ‘ overhang, and a medium weight flex rim. The goal meets the ASTM standards, adjusts 7 ½’ to 10’ easily with a hand crank. All Goalrilla goals are covered by a limited lifetime warranty. Crank Adjustment. The goal easily cranks up and down, 7 ½ ‘ to 10’. The handle to the crank the goal can be removed by taking out a pin, and this will set the goal to the height you choose. 1-Piece 5.5” Square Pole. The 10’ 1-piece steel post is the most stable in-ground system. Lower cost goals with the 2-piece poles will lean forward within a short time frame from being played on agressively. There are also basketball goals that have 1-piece poles that are 8’ in height, longer support arms are needed which causes the backboard to vibrate and twist more. Tempered Glass Backboard. The backboard is ⅜” tempered glass, and has a steel frame around it making it very sturdy. Overtime the glass remains looking nice, and will not become cloudy or yellowish like the acrylic backboards. The performance of a tempered glass backboard is outstanding. Independent Anchor System. The independent anchor system is one of the greatest features. 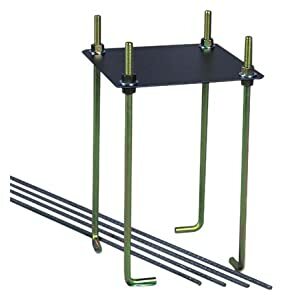 If you move, it’s as simple as unbolting the 4 bolts from the bottom of the goal, moving the goal to the new home, and purchasing and installing a new anchoring system at the new home. 2 ½ ‘ Overhang. The overhang on the Goalrilla goals range from 2 ½’ to 4’. The GS60c has the shortest, which leaves only a small distance between the playing area and the pole. Because of this a pole pad is needed to prevent injuries. Gauge of Steel. The gauge of steel is 13, which is the only Goalrilla goal that has the lower gauge steel. The thinner steel will cause it to vibrate more than the other goals with the thicker steel. No pole padding. Even with the overhang, pole padding should still be included with the hoop just in case someone does bump into it. Goalrilla does sell a pole pad separately if you are interested. All the Goalrilla basketball goals are the very best in-ground basketball systems available. The GS60c has the same features that are found on the 72” backboards; 10’ 1-piece pole , adjusts easily 7 ½ to 10’, and a limited lifetime warranty. The GS60c is a great choice when there are space or budget restrictions. The 60” backboard is a mid-size goal, which is only a size smaller than the 72” backboards played on in competitive sports. Cheapest place I found to buy it was at http://basketballgoalstore.com, which sells it for $1279, which includes free shipping. They are unable to post prices, but you can call/chat to get pricing. 72″ tempered glass clear-view backboard, adjustable 7.5’ to 10’, clearview backboard, one piece pole system, independent anchor system, heavy weight rim, large backboard. Not regulation size, no padding is included. The Goalrilla GS72C (model B5001) was originally introduced to the Goalrilla line up in 2011 as the Goalrilla GS72 B4001 the answer to a box store version of a 72” goal. The first model had a 72” x 40” backboard supported on a 6” x 6” X 10” post with a 3 overhang, h bracket supports and a medium weight rim. In 2014 the goal was reintroduced as the GS72C B5001 and upgrade to a heavy weight rim and the yoke arm moved to the outside for a clear view. Stable. All Goalrilla goals are built tough and the GS72C is no different, Its one piece 10ft post is engineered to handle strong play with little movement. Crank Adjust. Easy crank actuator will raise and lower you Goalrilla goal with minimum effort from 7.5’ to 10’. The handle on the actuator removes easily so you can lock your backboard at desired height. 72” Backboard. Although the backboard is not quite regulation size at 72” x 40” it does offer a large playing surface. Heavy Weight Rim. The Goalrilla heavy weight flex rim utilizes all-steel strength and stainless steel components and is protected from the elements with a durable powder coat finish. Steel Backboard Frame. Backboard are supported with full steel frame. Independent Anchor. Anchor system is concrete into the ground and goal is bolt to anchor to allow for easy movement of goal from one house to another. Not regulation size for high school and college play. Backboard in 72” x 40” with a 3’ overhang just short or regulation size of 72” x 42” with 4’ Overhang. No Padding included. The goal that is built tough for rough play but I would recommend adding a backboard and pole pad for safe play. The Goalrilla GS72C (model B5001) is a part of Goalrilla economy series. It offers all of the standard features of the Goalrilla Goals: Independent in ground anchor, backboard adjust from 7.5 to 10 ft, with 0 encroachment, steel framed backboard, weather resistant powder coat paint, lifetime warranty. The Goalrilla GS72C also offers 72’’ X 40” backboard with ⅜” glass, 3’ overhang, heavyweight rim and 6” x 6” x 10’ post. If you are looking for a large goal and do not care about regulation size or padding the GS72C could be a good choice for you. Cheapest place I found to buy it was at http://basketballgoalstore.com, which sells it for $1479, including free shipping. The GSII is the original 60” Goalrilla backboard Goalrilla produces a line of premium basketball goals, and has been in business since 1991. The GLR GSII (model #B3300) features a 3/8 thick, 60″ tempered glass backboard a a 6″ one-piece square pole. The backboard overhang is 3 feet. The height adjusts infinitely from 7.5 – 10 feet with the use of a crank handle mechanism. Included is a pro-style flex rim and an anchor bolt mounting system. The frame is powder coated to provide resistance against corrosion and UV rays. The GSII is backed by a limited lifetime warranty. The quality, the price, the warranty. I like the fact that Goalrilla basketball goals have been around so long. If I have a warranty issue they will still be there for me to call them years down the road. Also shows that with them being around so long that they are a good basketball goal and a stable company. I purchased this online so this made me feel more at ease with my purchase. Tempered glass backboard. At 3/8″, it’s only one notch below 1/2″, which is what you see in college and the NBA. Tempered glass is the best because it’s incredibly durable, rigid, and heavy. Movement is almost non-existent, so it’s optimal for performance. One-piece 5″ pole. This further adds to the overall stability of the hoop. It’s also necessary in order to support a thick tempered glass backboard. Flex rim. This rim is heavy-duty, and is designed for aggressive play. It has a lot of give when dunking, which protects the player and backboard. Anchor mount installation. 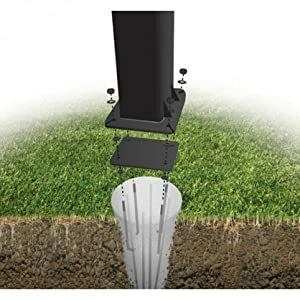 The best type of installation for in-ground hoops because the pole is not directly buried into the ground. It sits on top of the concrete, which allows for easy removal if necessary. Even though it is only a 54” backboard it is still a Goalrilla basketball system. It has a one piece post and is very sturdy and strong even when my husband and his friends play on it. I only have a small driveway and was not wanting anything too big that would look huge and overbearing. This was the perfect size backboard and I feel I did not have to sacrifice quality because of it. I don’t think it has made a difference not having a regulation size backboard for my kids. I have a lot of neighbors around the neighborhood that have these systems and they still look good. Assembly is pretty easy but the instructions are a little off on the amount of concrete it says is needed, so buy extra concrete. My husband was able to install it with just a couple of his friends which saved us money. Cost of adding options, like pads, netting, none of this comes with the goal. I would like the option to upgrade to a heavy duty rim and not just have to take the medium flex rim as my kids get older and bigger and for when my husband and his friends play on it. I also would like for the goal to drop lower for my younger children to be able to make a basket. The shipping process is not easy, it would be nice if they could take it to your garage or even if the truck driver could help with boxes. The anchor bolts stick out at the bottom of the goal, I would have to buy a “upgraded” pad to cover the bolts. When my husband plays aggressive with his friends it tends to shake a bit, I wish we would have been able to get this goal with the heavier rim on it. I did not rate it as a 5 star because of the shipping process. It is curbside shipping and the truck driver does not help you out. They schedule an appointment with a 2-3 hour time frame so I had to take time off of work and have someone with me because I could not lift all of the boxes on my own. The goal is great, but the shipping/delivery could be better. My kids love the basketball goal, they play on it everyday. I love the fact that we go outside and play together as a family instead of sitting inside watching TV or playing video games. It has been a huge hit with my kids. The cheapest place I found to buy it was at http://basketballgoalstore.com.